Wow, two articles at The Book Chook on the same day? Here’s a really important announcement on something I care deeply about. Can you help? School libraries encourage children to read and write. They provide a safe, welcoming place for your child to spend time during their school day. 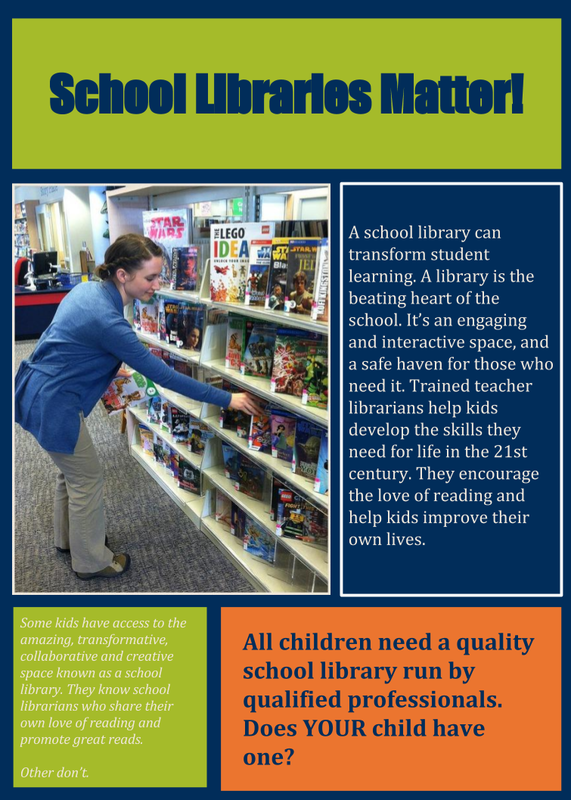 Constant funding cuts to staffing and resources are putting the future of school libraries at risk. In 2018, the School Library Coalition will mount an Australia wide campaign to demonstrate how important they are, not just for your child's school years, but for lifelong learning and fulfilment. To help us, we're looking for stories about how children have received significant benefit from participating in the literacy, social and cultural activities of the school library, or simply from feeling nurtured and engaged. Or perhaps you have an experience of how school library staffing cuts have impacted on your child’s learning or wellbeing. If you have a personal experience that you're happy for us to share (we can change names if necessary), we'd love to hear from you. This is important!!!!! Totally support this campaign!!!! Wonderful to have the support of authors like you, Susanne! Would it be ok for me to borrow your perfect wording for a funding campaign for my school library in the US? Hi Sara, Can you please contact me - via the Contact Me widget top of the left column on this page so we can discuss your request.